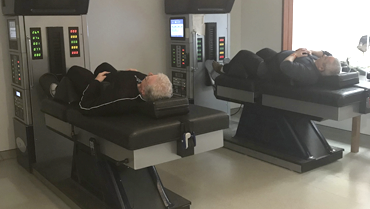 Our exclusive Class IV Laser and Non-Surgical Spinal Decompression (DRX 9000) technologies provide long-term solutions for a variety of chronic challenges. Say no to painful epidurals, surgery and medications and yes to a painless, effective alternative! Long gone are the days of putting yourself in more pain to rid yourself of your existing pain! At New England Spine & Disc, we're committed to offering our clients the most cutting-edge pain treatments available. We fully believe in using technology over the traditional invasive methods, as it allows our patients to remain comfortable and has fewer risks! We utilize equipment including the DRX 9000, class IV lasers and more to treat our clients' most intense pain. Decompression treatments are very gentle. In fact, every once in a while we’ll catch a patient sleeping during their treatment! Patients simply lay on their backs wearing a specialized belt around their waist. We set the machine to focus on the problem area and the advanced decompression therapy computer system does the rest. The recommended protocol for this therapy will vary from patient to patient, however, we generally recommend between 8-24 treatments to correct the root cause of your problem. DRX 9000 treatments include your injured disc being gently separated. This forms a vacuum, allowing the disc to be pulled back in. The result takes pressure off of the disc’s nerve roots and provides relief to the affected area. This procedure isn’t painful and takes around 25-30 minutes. 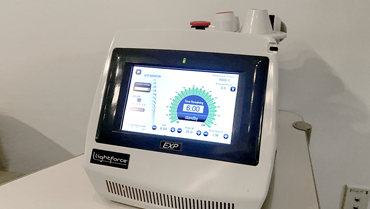 Your laser therapy technician will guide a laser over your affected painful areas and administer a mild light. This treats your chronic pain, increases circulation and reduces swelling. The laser is painless, but occasionally you may feel a bit of tingling and/or warmth. At New England Spine & Disc, we provide various decompression, shockwave and laser therapy treatment options to treat even the most severe chronic conditions.